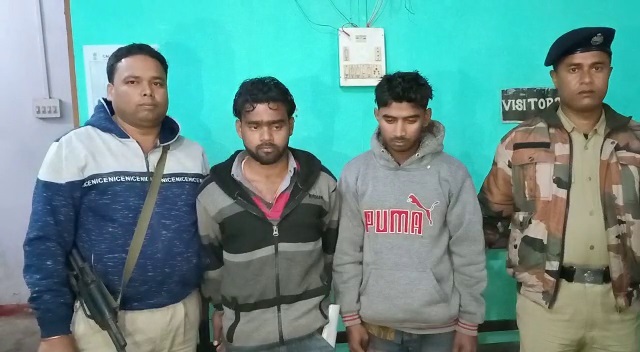 Locals caught two young drug peddlers red-handed and handed over to the Kalyanpura police under Khowai district of Tripura on Saturday. The drug peddlers were caught from the Old Motorstand area along with 25 bottles of suspected heroin where they had come to sell those contraband. Swapan Paul, a local said this is the second incident in 48 hours where alert citizens caught drug peddlers and later handed over them to the Kalyanpur police. Only a two days ago two other youths were caught along with heroin from Kalyanpur Bazar Colony area. Inspector Santosh Shil, officer in-charge of Kalyanpur police station said that during the evening time they got the information that locals have caught two drug peddlers in Old Motorstand area and immediately he along with other rushed to the spot. Locals handed over to police, the two persons along with 25 bottles of suspected drugs and so they were brought to the police station and for taking legal action against them. During the last ten months, various security forces including police, BSF and other paramilitary forces have recovered more than 67000 kilograms of dry ganja and thousands of bottles of contraband and Yaba tables beside brown sugar and heroin during raids in various parts of Tripura under the state government’s ‘nasha mukth Tripura abhiyan’.